It’s that time of year again for the Pinellas County Schools Administration Building Art Exhibition!!! This special exhibition showcases artwork of Pinellas county students. The Artwork was selected from the 2008-2009 school year. The selected Artwork will now be on display for the 2009-2010 school year. 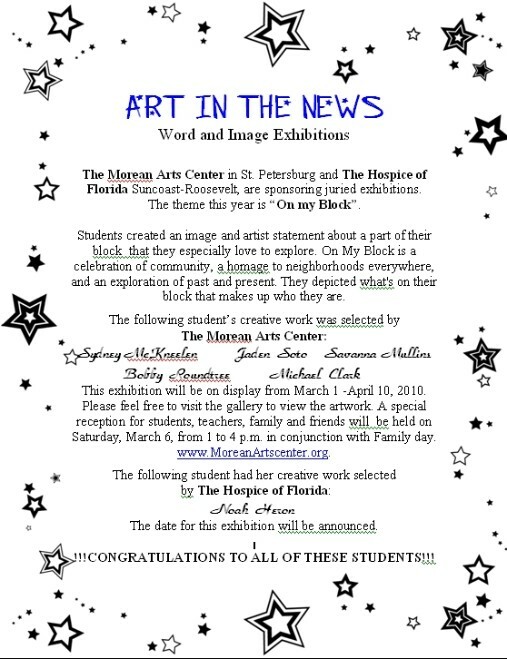 CONGRATULATIONS to the following students whose creative artwork was chosen for this special exhibition!!! Trian Phung, Katie Richards, Rachel Wing, Nikki Iachini, Maggie Vaughan, Kristin Moorehead, Elizabeth Kidney, Hope Heron, Caroline DeMuth, Katherine Lingenfelter, Skyler Hamilton, Yulmaris Grau, Stephen Durst, Josie Mead, Tori Wateska, Chyanne Armstrong, Katelyn White. November 4, 2009. Congratulations to these talented students!! !